Finance expert John Capper is helping 3D metal printing pioneer Eclipse AM to achieve high growth. Founded by leading 3D development engineer Simon Scott, in partnership with Staffordshire Precision Engineering, Eclipse AM is destined to be a leading player in the production of metal parts for the automotive and aerospace industry with the use of 3D printing technology. John, from Cheddleton, began working with Simon over 12 months ago when the Newcastle-under-Lyme based business was still on the drawing board. 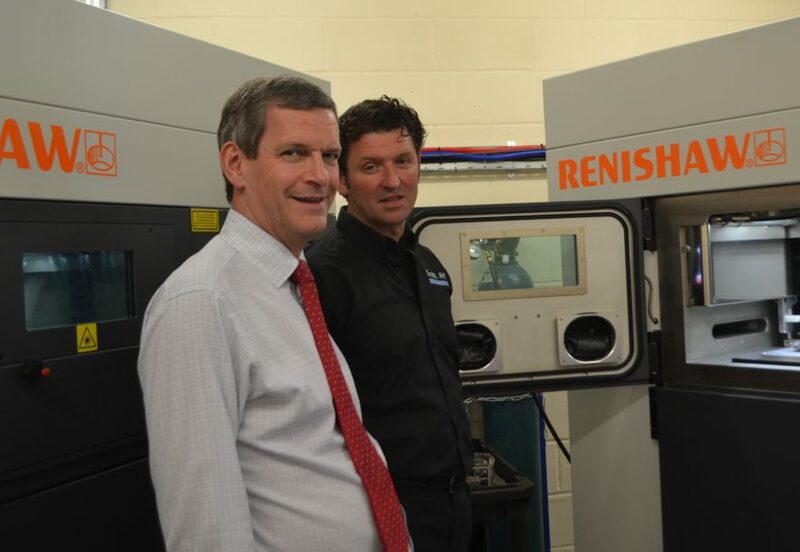 Simon was at the forefront of the development of 3D printers as a Director at leading engineering company, Renishaw PLC. With John’s support, Simon is growing Eclipse AM, which uses two Renishaw 3D metal printers, to develop unique new manufacturing technology, engineering prototypes together with engine, machine parts and medical applications. Simon added: “I met John while working on business plans for what became Eclipse AM. I have the technical knowledge, and I worked on the development of the machines we work with, but I needed support with business planning, strategy and finance. Eclipse AM, the AM stands for Additive Manufacturing, has the use of £1m worth of additive manufacturing machines, originally designed by Simon. Working in titanium, stainless steel and aluminium, the company is gaining a reputation with the Formula One motor racing teams, the wider automotive industry and aerospace. The business is a good fit for Staffordshire Precision Engineering who have a 30-year reputation serving the same industries. The 3D metal printers are housed at the Staffordshire Precision Engineering factory at Parkhouse, Chesterton alongside a wealth of their other precision engineering machinery. Staffordshire Precision Engineering is run by brothers Phil and Gary Smith, who believe the move into 3D metal printing with Eclipse AM and Simon gives their business a competitive edge. The partnership with Eclipse began after Simon was introduced to the Smith brothers through the Staffordshire Chambers of Commerce Let’s Do Mentoring programme. The former Managing Partner of accountancy firm RSM Bentley Jennison, John now splits his working time between mentoring, growing Staffordshire and Cheshire businesses and a leading role as Executive Director of EGIAN, the European Group of International Accounting Networks. Another recent project saw John drafted in to develop financial plans for AMRICC, the Applied Materials Research, Innovation and Commercialisation Centre which is being established in Stoke-on-Trent.